Bounce Back Win in Toronto · Let's Go Amerks! 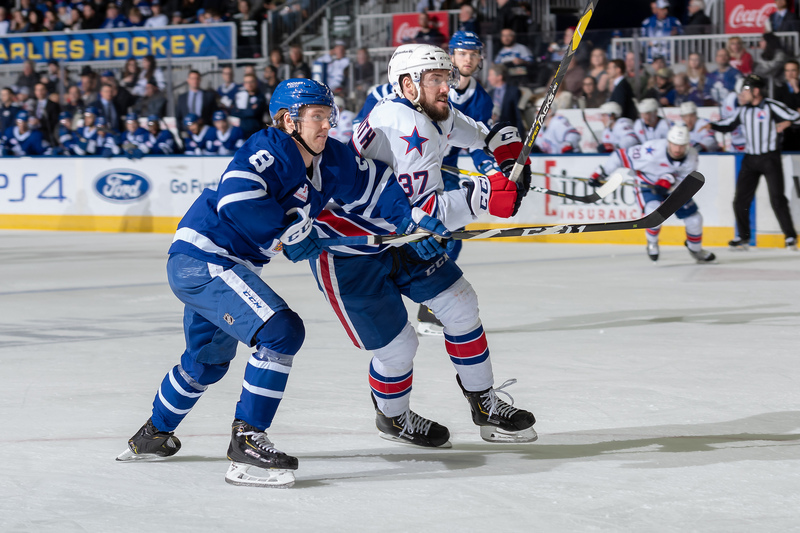 After an ugly loss (in ugly jerseys) on Friday night the Rochester Americans took care of business in Toronto with a 5-2 road win lead by Victor Olofsson who scored twice. Scott Wedgewood played a great game in net as well with 23 saves for his 26th win of the season. Rochester also earned their 40th win of the season in just 66 games. Chris Taylor is the first Amerks head coach to lead his team to 40 or more wins since Benoit Groulx did during the 2009/2010 season when the team finished with 44 wins after 73 games. Rochester is also the third team in the American League to reach the 40 win mark on the season. The game started with some fireworks during warm ups when a Rochester player reached across the red line to retrieve a puck and Tom Sestito took offense to it. Dalton Smith was quickly at the red line to have discussions. Old time hockey!! The two teams met at the red line and exchanged words but it’s safe to say everyone knows better than to escalate the situation and risk suspensions. Halfway through the first period Dalton Smith and Tom Sestito took care of business and dropped the gloves. No surprise that Dalton Smith gets the win with that one. Toronto scored first at 13:27 of the first period when Chris Mueller picked up a loose puck in front of the net to score his 29th of the season. Remi Elie scored just over three minutes later at 16:51 off an excellent feed from behind the net from Wayne Simpson. Kyle Criscuolo had a secondary assist on the goal. Kyle Criscuolo earned his second point of the night redirecting a Jack Dougherty shot past goalie Michael Hutchinson. It’s the first goal for Criscuolo since January 26th. Dalton Smith and Yannick Veilleux were back in the lineup made a difference not only with the fight but also hits, corner battles, and making Toronto work in their defensive harder than they may have liked. Lawrence Pilut also had a better game with multiple scoring chances and finished with four quality shots on net. Former Amerks forward Nick Baptiste scored his first goal with the Marlies to tie the game 2-2 at 13:30 of the second period. He was able to redirect a shot from in front of the net and beat Wedgewood. Toronto had a five on three power play chance for 52 seconds late in the third period and Rochester came up with a big penalty kill lead by Scott Wedgewood with a couple of big saves. The game opened up when Victor Olofsson scored two goals from the slot in less than four minutes. Danny O’Regan had an assist on both goals, Will Borgen had an assist on the first one. Olofsson now has 27 goals this season with 10 games remaining. He could enter an impressive club if he can reach that 30 mark. CJ Smith sealed the 5-2 win with an empty net goal with 2:51 remaining in the game. Taylor Leier forced the puck up the boards, CJ Smith took off, Kevin Porter spotted him and sent the puck down ice. Rochester now has a five point lead over Toronto who sits in third place, and 11 point lead over Belleville in fourth place. Syracuse won Saturday night and has a five point lead in first place over Rochester. There’s 10 games remaining for Rochester, every win will continue to be important like it was today. Toronto and Rochester play again Sunday afternoon.